Following the success of the previous post (Path of Exile Economy: Currency Trading), in this article I'll explore several additional methods and frameworks for making a profit by using probability, market imperfections and asymmetric information. I assume the reader has some amount of experience both playing and trading in POE - and/or you read the previous post that covers some of the basics of POE economy and trading process. Note that all prices are from the time of writing and will be different in the future - my goal in this article is to describe the process and logic behind such profit engines - the examples I showcase are just that: examples, and they might not be profitable next month - who knows? One of my biggest sources of joy and entertainment in POE is (unexpectedly) not part of the gameplay at all. I like reverse engineering the math behind the economy. I try to understand what makes it tick - because that's the way to find profit-generating loopholes. POE provides a great sandbox for research and experimentation - since, you know, it's just a game and all the money is virtual - but it's complex enough for the tools and models from real world economics to apply. In the following sections we will see not only how to make profit within the POE P2P (player to player) trading ecosystem - but also that these loopholes exemplify real world processes and economic forces, because humans are humans - whether in game or in real life. There are quite a few divination cards in POE that produce currency items, from wisdom scrolls all the way to mirror of kalandra. For the ones that can be exchanged for expensive items the pricing is very straightforward - House of Mirrors is 16-17ex, which makes sense as the mirror is ~150ex. The ones that require many cards to get average results (like Rain of Chaos or The Catalyst) are usually too cheap to trade for or bother with. But there is a middle ground. Cards like Vinia's Token and Lucky Connections hold around 2c value each - but not exactly. For example - each Vinia's should be valued at about 2.4c (5 cards give 10 regret orbs, and the price of buying regrets is about 1.2c at the moment). Some players price it at 2 regrets - which is obviously most accurate - but some want c, so the price has to be rounded somewhere, usually 2c. More often than not it's a player who just found one, has no intention of farming a full set, and just wants to get some value from the card. Earlier today (at the time of writing) I bought a set (via 3 transactions) of Vinia's Token for 10c, netting 10 regret which I can sell for 12-12.5c. That's about 0.6c profit per transaction - not amazing but unlike currency trading this can be done via your initiative - no need to wait for anyone to offer trades to you. As an added bonus, there's no price fixing since none of the scammers care enough about this small market. A couple of months ago a Lucky Connections dropped for me at a Port map - so I did the same process but had to wait for cards to show up with a 1c price (back then c was more expensive so it made sense to round a ~1.4c value down to 1c) - but a 7c -> 20F trade was a good deal even when fusings were about 0.5c (again about 0.5c profit per trade). 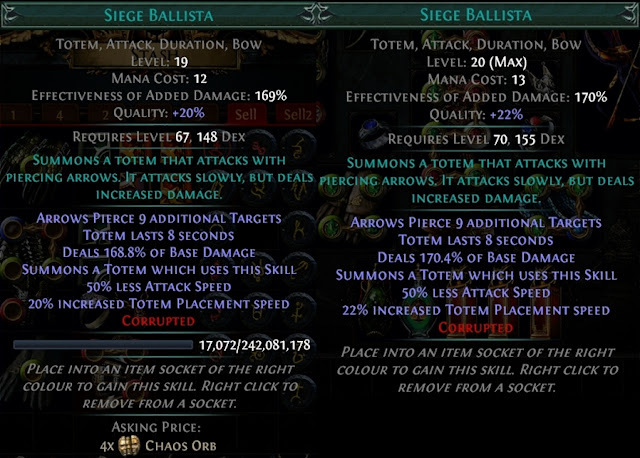 Another straightforward example is Chayula's splinters (costs 2c) while Chayula's breachstone is ~210-215c. So you can earn a 10-15c "commission" for going through the trouble of collecting all these splinters (which should net somewhere between 0.7-1c profit per exchange - not bad!). The last example is The Vinktar Square. This unique map can be created by vendoring 4 unique staffs (Agnerod North, South, East and West). The map prices vary somewhat but at the moment you would be able to sell it for ~67-70c easily. Each rod can be picked up for about 14-15c, then vendored, then the map sold - producing 1.5-2c profit per trade (which is actually crazy good). Ordered by their cardinal directions. Yes, they all look the same so you'll just have to trust me. Got each of the rods for 14c, but it did take on average about 6-7 tries to get one that wasn't sold and the player not AFK. I almost sold the map for 69c but decided to run it myself - forfeiting 13c of profit! The market failure here is that players keep paying too much for complete maps, instead of buying the pieces - probably due to lack of knowledge about this vendor recipe. Fated uniques are (better) versions of ordinary uniques that can only be obtained by fulfilling a prophecy while the basic unique item is equipped. Each fated unique has it's own specific prophecy that must be first obtained (either by asking Navali and being lucky or by buying a sealed prophecy from another player) and then fulfilled to get the upgraded item. 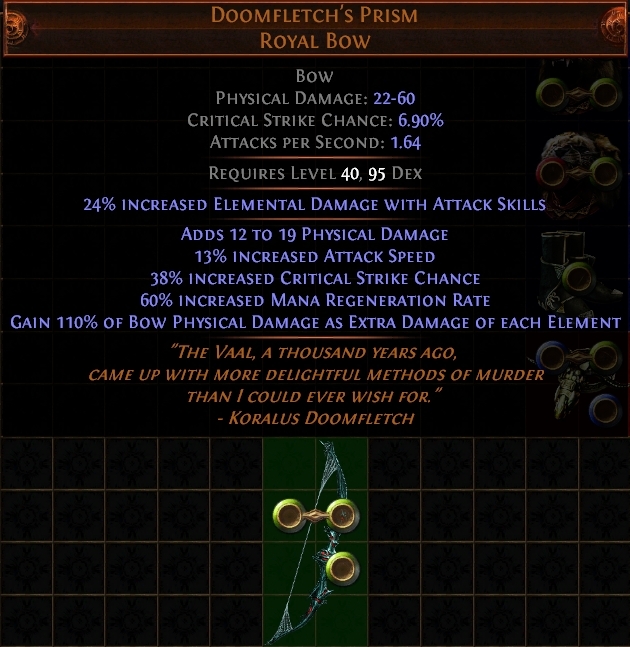 - Doomfletch - that you can get practically free (1alc) or several chaos for an almost perfect roll - get's upgraded into Doomfletch's Prism - which is valued at 40-50c for random rolls and in the 1-2ex range for very high rolls. The prophecy (Ancient Doom) costs about 45c. 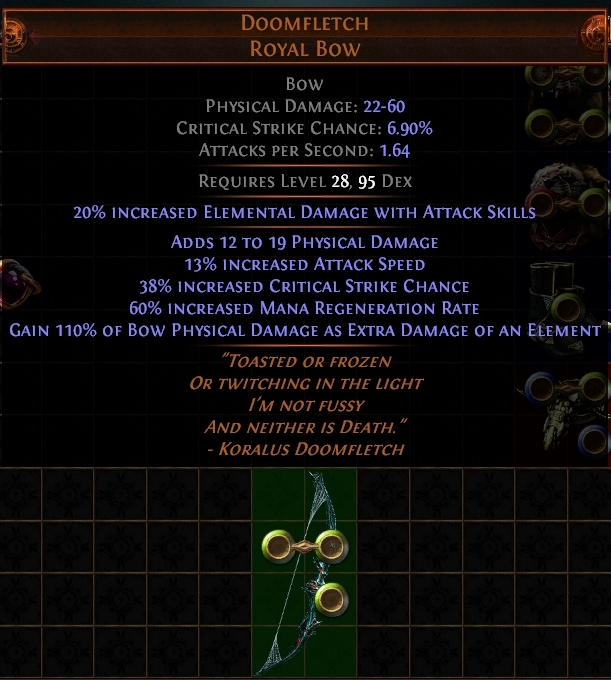 I'm not sure if there is some deep reason why bows get special treatment (the third most expensive fated unique is The Signal Fire quiver - also for bow characters) but it doesn't really matter for our purpose. The basic idea is we can buy the "ingredients" - the base unique and the prophecy - and get something that can be more valuable, thus making profit in exchange for our effort (a couple of trades and killing the relevant boss). Note that the quality of the rolls has a strong effect on the price of the fated versions (as in any high value unique), and most fated items add at least 1 randomly rolled property when they become the fated version. Although on average it seems to be profitable, I promised profit with no luck involved. Enter Doomfletch's Prism. It only changes a property - doesn't add new ones - so all the rolls are determined purely by the base unique. 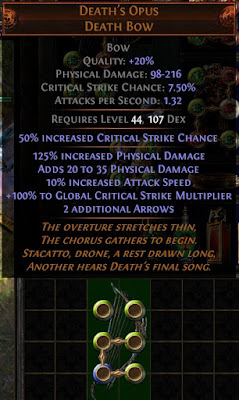 If we look on poe.trade for the basic Doomfletches, filtering out anything below 80 physical DPS and below 37% increased crit chance (leaving us only with well rolled bows), ignoring the price fixers and taking the cheapest 10 results - we see a price range of about 20-30c (although I just bought one for 15c - so take any price ranges with a grain of salt). 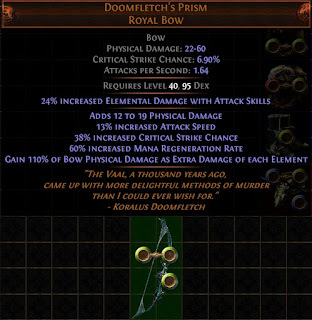 If we do the same for Doomfletcher's Prism we see roughly 100-150c. According to this math, even if we buy a good base unique for 30c, pay 50c for the prophecy, and sell the fated version for the low price of 100c - we still make 20c profit. As always - we should be careful when using poe.trade prices directly when there is a small sample size of traders for the specific item (the top 10 results for these well rolled Doomflether's Prisms span the range from 1ex to 7ex), so you never know what you'll actually be able to sell before you try. And sold for 0.9ex - 25c profit! So we transform 8.9c in jewelers into 11.4c in fusings. Free 2.5c everyday is pretty nice - so don't forget to do it! You go Yeena! Best deal in town. Note that the relative prices on the P2P market is 7.2/1.75 ~ 4.1... In principal, that means that no rational trader should ever sell jewelers at the current prices - they should exchange them into fusings at vendor price (!!!) and sell the fusings. The extra few percent of value is perhaps not worth the clicking (and if too many players will start actually doing that jewelers will become rarer and the price will rise - nullifying this gap), but as a note for the future - vendor deals can sometimes create alternate trading options - providing an edge on the market. Now, in a perfectly rational, complete knowledge marketplace (like the one classical economists usually talk about), that would mean that there is a lower bound on the value of any 6-linked item - regardless of its properties - as it can be vendored for a divine at any time which we could then sell for some c (~16 at moment). As the owner of the 6-linked item the vendor recipe creates an additional route to approach the market that players are free to use if they wish. Not only does it work, but some more determined people (who are willing to go into the grey area of the GGG user agreement and use scrapers and bots) seem to be exploiting this pattern consistently. "Catching" players at the exact moment they list an underpriced item was somewhat of a headache - mostly because most often than not I was too late. I was able to get the Tabulas underpriced by 1-2c but not the ones cheaper (yes there were some listed even cheaper). My guess would be that some people saw the same loophole and now employ private stash scanners and/or trade bots to get the most profitable deals. After a while I gave up and limited my filter to see only the slightly underpriced 6-links - so I stopped wasting time without getting any response - but I was still able to generate ~1c/trade returns on average. All due to information asymmetry. In my previous post about currency flipping I've talked about the price margins and trade volumes needed to maintain an average profit above a certain level, and in principal scrolls are no different. As the cheapest and most common currencies in the game, you might guess that the trade volumes must be large (otherwise it's not worth the time) but other than that it's just another currency to flip. Turns out there is a more interesting effect in place. I get trades regarding wisdom scrolls maybe once every couple of days (don't forget - I intentionally do not offer the cheapest prices on the market) but when I do, the price margins are huge. I usually sell wisdoms at ~100/1c and buy at ~300/1c. No other currency has a 3X difference between buy and sell prices. What's going on here? One aspect is simply the fact that there are relatively few currency trades dealing with scrolls - probably it's (wrongly) perceived as too low value to even bother, thus making the market less competitive. But I believe there is an additional effect. Who buys scrolls in the first place? I mean - the drop rates are very high, so who needs more scrolls? Usually these are the more experienced and advanced players on the higher level characters. Since they are probably efficiently farming high level content most of the time, a wisdom scroll is literally not worth the nuisance of clicking on it and the time to walk to it - so they don't. For them paying 7c or 10c (as an example) for 1000 wisdoms is practically the same - 3c is pocket change at that level and 1000 wisdoms will last quite some time. So we can charge relatively high prices. Who are selling these scrolls to me in the first place? Usually newer player - or at least newer characters, trying to get enough c to buy some piece of equipment, so they are selling what they do have to anyone who wants it. They still pick up scroll loot - so they feel first hand how common their drop rate is - and they probably have thousands in the stash. Their value is perceived to be low - almost negligible, so much higher prices seem to make sense for them. If that is the case, then the price gap stems mostly from the difference of perception between various categories of players. In the future it's valuable to look for these types of differences in value. White leather belts being another example: practically worthless for most players, but the ones who try to chance Headhunter need them in large quantities - creating demand and subsequently monetary value (it was common to get 5:1c deals on the leather belts back in Legacy league). Back in Legacy League, the price of the guardian maps was almost always the price of the shaper fragment that will be dropped by the map boss + a small additional cost - representing the possible loot and exp from the rest of the map and the chance to get a guardian unique that's worth something. So assuming you are able to complete the maps and get the fragments - you are guaranteed a profit of 1-3c per run - before including any loot from mobs along the way. The guardian maps are mostly fairly linear and have good topology, then what can explain this weird price price gap? One possible explanation may be that the guardians are long, difficult and sometimes very dangerous fights (depending on the map mods). At the very least it takes a long time to complete for the vast majority of characters - while the returns from the boss itself (except for the fragment) are often negligible, so the battles are perhaps not worth the time. That being said, many players still perceive the Shaper fight, despite being very very long, to be cost efficient - so there is constant demand for the fragments, creating a market force incentivising some of the players to beat guardians despite the difficulty. So if you are not afraid of the challenge, guardian maps are guaranteed profit at the moment. In the future, be on the lookout for similar situations - where there is a guaranteed (or almost guaranteed) return on investment that covers the costs of said investment and then some. When the time comes to get a build into its final form, many of the purchases include corrupted versions of items - mostly gems and uniques. 2 tries are apparently not enough, but how many is? - No effect (other than adding the corrupted property). - Add or subtract one level. Max level gems can exceed their normal maximum this way. - Add or subtract 1-10 quality. Gems can have up to 23% quality this way. - Change the gem to its corresponding Vaal Gem (if there is no Vaal version, this is identical to the first option). First, we need to figure out the relative probability of each of these outcomes. I was unable to find a completely definitive answer (though I spent hours googling and reading posts) but items follow 25% for each type of outcome - so a reasonable assumption would be that gems work the same. Note that this may be not exactly accurate - only GGG know for sure. Second, once the type of outcome is chosen, there is still the specific roll to be determined. In the case of level change it can be either +1 or -1 so (again assuming the roll is fair) you should get +1 level about 1/8 of the times. This is consistent with the common wisdom that you should level 7 gems of your main skill (1 in use and 6 in the off hand equipment) to then vaal them all at 20/20 and hopefully get the coveted +1. to end up 23% quality (again, assuming all rolls are equally likely). Siege Ballista is a very niche skill so I have to do it myself, but armed with this math we can consider making a profit by vaaling highly popular gems. - The value of effort in leveling a gem from level 19 to 20 is priced at 10c for uncorrupted gems, but at 5c for corrupted ones. - It takes ~240 million exp to get Maim from level 19 to 20, but only ~100 million to get it from 1 to 19. Meaning, if you buy 1/20 gems and sell 19/20 - you're making more profit per exp than upgrading 19/20 -> 20/20, especially since you can often pick up ~15/20 gems for the same price as 1/20. Now we're getting to the main question: suppose we have a 20/20 Maim gem, should we vaal it or not? Which is much more than the ~31c we started out with - so the answer is yes. As always, price checking on poe.trade is a little problematic - you can usually get cheaper items if you wait and seize opportunities - but that's true for all parts of the equation so it shouldn't affect our conclusion. The most sensitive point in the calculation is the ability to actually sell corrupted 20/20 gems for 25c which I'm slightly skeptical of, but even if the price goes as low as 20c we are still well in the profit margins. Corrupting uniques is a similar process and a similar calculation - the main difference is the higher volatility. When corrupting a unique item it might "brick" - becoming a rare of the same type - often rendering it worthless, an outcome we didn't have with gems. The relative probability for the various corruption qualities can be calculated from the datamined information here, so once the prices for each outcome are checked - you can make the same calculation for your favorite unique to determine the profitability of corruption. As we mentioned in previous sections, the price of high end equipment depends greatly on the exact mod rolls it has. Mirror-level rare equipment crafting and rolling is an art in itself (which, to be honest, I am yet to master) so I'll talk only about uniques - thought the basic math works for any POE item. The best rolled unique items routinely have 4-5 times more value than random mediocre rolls. 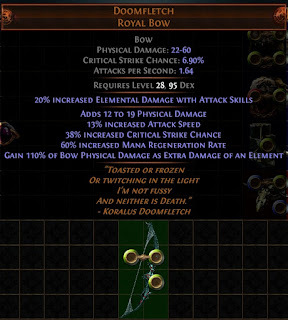 The fated bows mentioned before are an example, not to mention high end uniques like Atziri's Disfavor and Starforge - but not Bisco's Collar: an almost perfect amulet costs only ~50% more than low rolls. What's going on here? Enter Divine orbs (D for short). Since you can reroll explicit stats for your equipment, we can imagine the value of a unique item to be made up from 2 parts: which item is it + how high are its stat rolls. For the price of 1D, you can maintain the type of the item (which can be changed by ancient orbs for example) but buy another shot at better rolls. The easier it is to get high rolls, the less price discrepancy there will be between the mediocre rolled items and the high rolled ones. But what do we mean by "easy" to get high rolls? Well the question is what rolls do we want. Let's do 2 examples that will exemplify the difference (note that there are many cases when the math is actually more complicated - for example when the minimum and maximum added damage are separate stats - and should probably done on a spreadsheet or via script, not the "napkin-back" math I'm doing here). Starforge - currently considered the best 2H sword for physical builds - is not cheap. The cheapest one currently listed in Standard is 3ex. The one with the highest DPS is 15ex. Should we buy the cheap one and Divine it up or should we just buy the better version? 101 possibilities for the damage increase, 4 possibilities for the attack speed and 11 for the extra life. 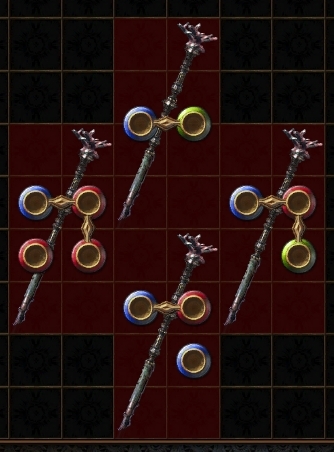 The 15ex sword is 496, 8, 99. How many Divines, on average, would it take to get the rolls at least as high? Assuming all values are equally probable (which is widely believed to be true but has not been proven), we see that it'll take, on average 1/0.00225 ~444 tries to get such a good roll. Considering the Standard conversion rate is approximately 1ex : 5-6D, the 12ex price difference gets us only ~70D, so if we really want to get such a near perfect roll we are much (much) better of just buying the high rolled sword (in that sense, it's actually underpriced). Which is still cheaper to buy outright but now the difference is smaller. So we see that even though the price difference between low roll and high roll is X5 - it's still much better than trying to get it yourself via Divines - since there are 3 stats, all of them desirable and important which together make a high roll very improbable (especially the very wide range of the increased damage). If we think about Bisco's in the same way, there is actually only 1 stat that really matters: (50-100)% increased Quantity of Items Dropped by Slain Normal Enemies. If we want a very good 95%+ version, we have 6/51 = 0.118 => 8.5D - so there is an upper limit to the price difference between low rolled and high rolled Bisco's uniques. So if the difference is more than 8.5D you are better off buying a low roll and upgrading yourself. Even better - if high rolled amulets seem to be selling successfully with a higher price margin - consider buying, upgrading and reselling systematically for a possible substantial profit. This has been quite a longer piece than I've originally intended (and was written in chunks over several weeks). POE is a deep game that rewards players for intricate knowledge - from in game mechanics, vendor recipes and bonus stacking to data mining drop probabilities. When it comes to P2P trading, seeing loopholes sometimes means knowing the game much better than most players - otherwise everyone would be doing that and the market would rebalance itself. That is why finding these "less traveled" economic routes is satisfying for me: it's not the c, it's the mastery. Until next time, may you see the holes others do not. I currently learn a lot about Neuronal Networks. I start to see so many applications for NN. It is mindblowing. 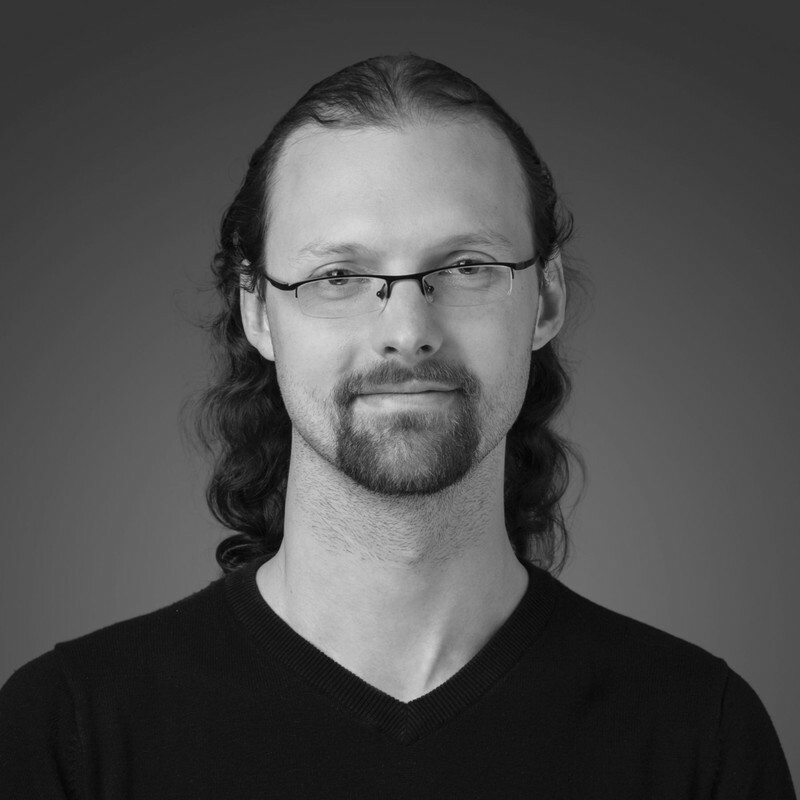 I already knew all of the techniques in this article, but still the article opened my eyes for a new way to use my knowledge about NN. PS: I read those other articles from you on this website. I like your mentality about your motivation. It is a shame that I didn't have this kind of motivation in the last few years, but I earned this mentality in the last few months.